The Broward County Police Benevolent Association, the voice of law enforcement in Broward County, announces the transition to its new Executive Board following the swearing-in ceremony on Thursday, January 3, during the organization’s January Board of Directors’ meeting. Rod Skirvin takes over as President after serving the previous six years as the organization’s Vice President. 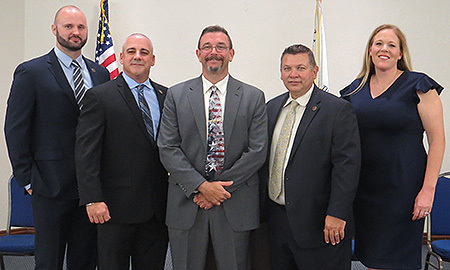 Skirvin, a 25-year member of the Broward County PBA, was a detective with the Coconut Creek Police Department upon his retirement from that agency in January of 2018. Thomas Tiberio moves into the role of Vice President after serving as the organization’s Treasurer since June of 2016. Tiberio is a Sergeant with the Miramar Police Department, and has been a member of the Broward County PBA since 1996. Kevin Loughran begins his first, three-year term as Treasurer. Loughran is a road patrol officer with the Wilton Manors Police Department, and has been a member of the Broward County PBA since 2014. Meghan Anderson continues in her position as the organization’s Secretary, after being elected to her second, three-year term. 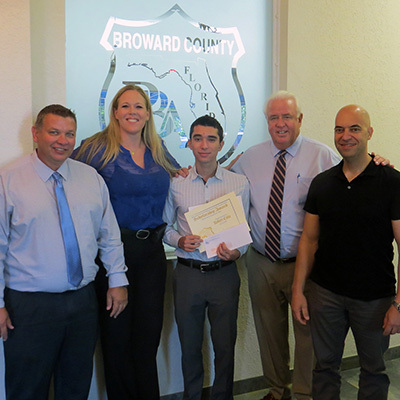 Anderson is a Broward Sheriff’s Deputy and is currently assigned to the Parkland criminal investigations unit. She has been a member of the Broward County PBA since 2002. Hallandale Beach mayoral candidate Keith London is misleading the citizens of his city when he claims in recent social media posts that he has the support of the municipality’s first responders. In fact, nothing can be further from the truth, as members of both the Broward County PBA and the Hallandale Beach Professional Fire Fighters have joined forces to actively campaign against his candidacy and officially endorsed Joy Adams.